A more or less conical part with spiral grooves for gut, and after circa 1640 chain, which connects to the barrel. 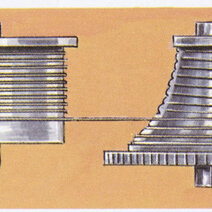 It regulates the power transferred to the gears. Almost all sixteenth, seventeenth and eighteenth-century watches have a fusee.